Is there anything more fun than coming home to a brand new package from Stitch Fix? I think not! I’m always excited to see what my stylist, Lucy, has selected for me, and this month she brought me another fun warm-weather themed fix. From tunics to cold shoulders, this month’s Stitch Fix was full of fun colors, patterns, and prints. I’m sure you know the drill by now, but if you’re new to my blog or Stitch Fix, it’s a clothing styling service that you can set up to receive monthly, or at your leisure. You are charged $20 as a styling fee that you can put towards anything you keep from your Fix. You can plan to receive five items – typically four clothing items and one accessory (jewelry or bags, typically) or a pair of shoes! And, if you missed my review last couple of reviews, then you may not know that Stitch Fix is now sending shoes! Be sure to update your profile with your shoe size if you haven’t already. If you aren’t aboard the Stitch Fix train yet, now’s a good time to be, especially if you’re in the market for some cute new shoes! Want to see what I received? Then keep on reading! This month I received another darling off the shoulder style, this time in tunic format! 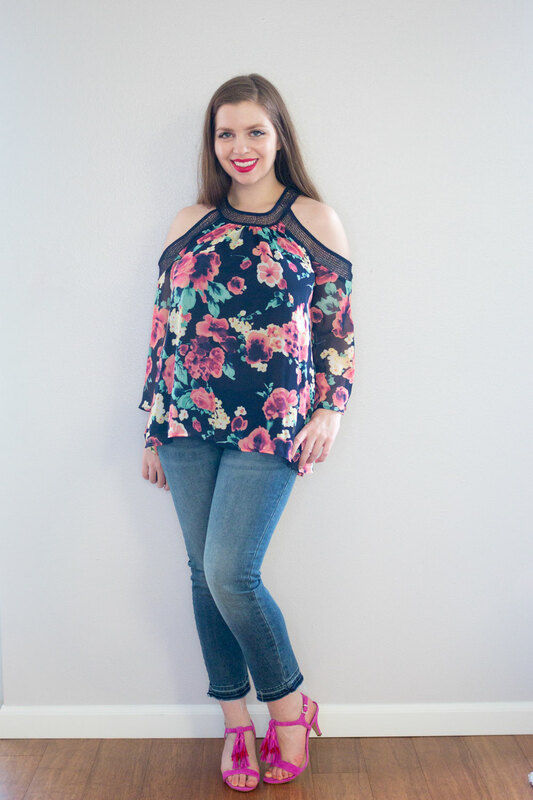 I can’t get enough of the off the shoulder look – I find this is such a flattering style on nearly every shape and size, and it’s so romantic and summery! The black color makes this one hard for me to keep because I have a certain dog who is shedding like a madman currently. However, I do really like the contrast between the tunic and these Levi’s CT 501 white boyfriend jeans. If I were living in an ideal world, I would have paired them with a white skinny jean, however since I don’t own a pair, I’m working with what I got. 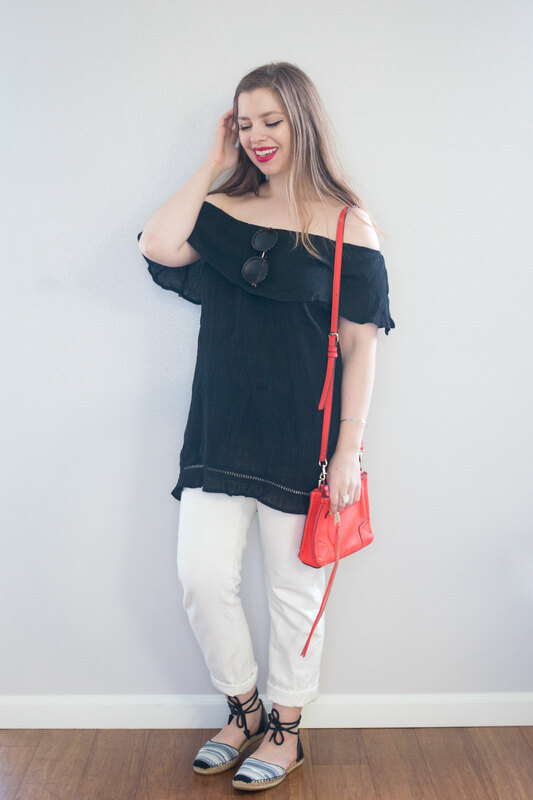 ;) I also added these super comfortable Libbi Espadrille Flats from UGG and a fun pop of color bag from Rebecca Minkoff to round off this look. 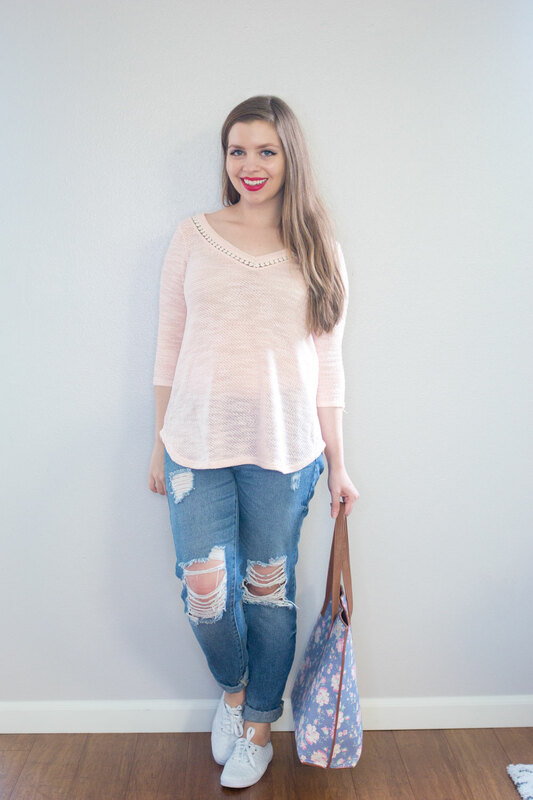 I’ve paired this top with my raw hem denim from Old Navy that you probably recognize from my last Stitch Fix post. They’re so comfortable that I really can’t stop wearing them. I also added a fun pop of color with these fun new Melsy Dress Sandals from Vince Camuto. They’re an HSN Exclusive and part of the brand new Alice Through the Looking Glass Collection that launched just in time for the movie! For a fun accessory, I added this gold tassel necklace that I found at my local Fred Meyer store (shop similar) and this Alexis Bittar Ring that was in my winter The Zoe Report Box of Style. 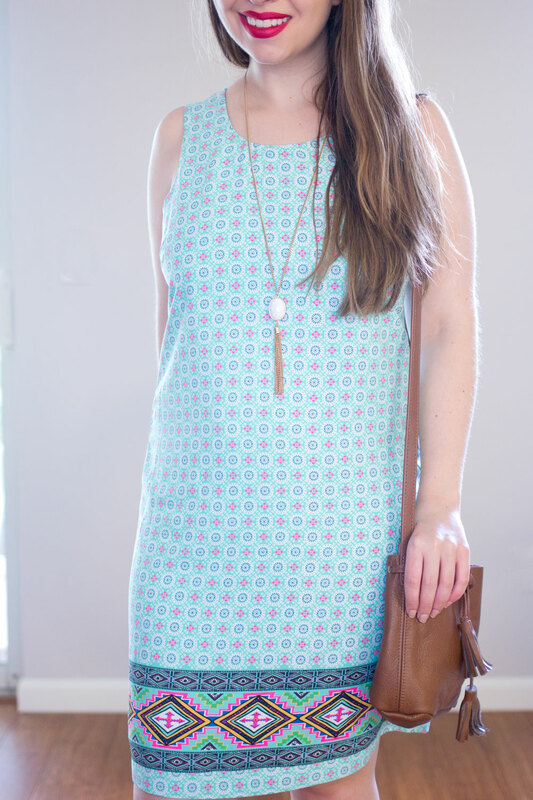 If comfort is your jam, then this top from Loveappella would be your new favorite. It’s so soft and cozy that it felt like pajamas. Fortunately, it doesn’t look like it at all! Because of the comfy-cozy vibe it was giving me, I could totally see wearing this to run errands all around town. That’s why I paired it with a large floral tote (shop similar) to fill to the brim and a comfy pair of Eyelet Sneakers from Keds. The distressed boyfriend jeans add to the overall casual look and make me want to wear this outfit on repeat every weekend. If I’m honest, this was my least favorite item out of the box. Surprisingly, once I put it on it ended up being much different than I expected (in a good way, of course!). It just goes to show you that first impressions aren’t always the best, but that doesn’t mean you should totally write something off. 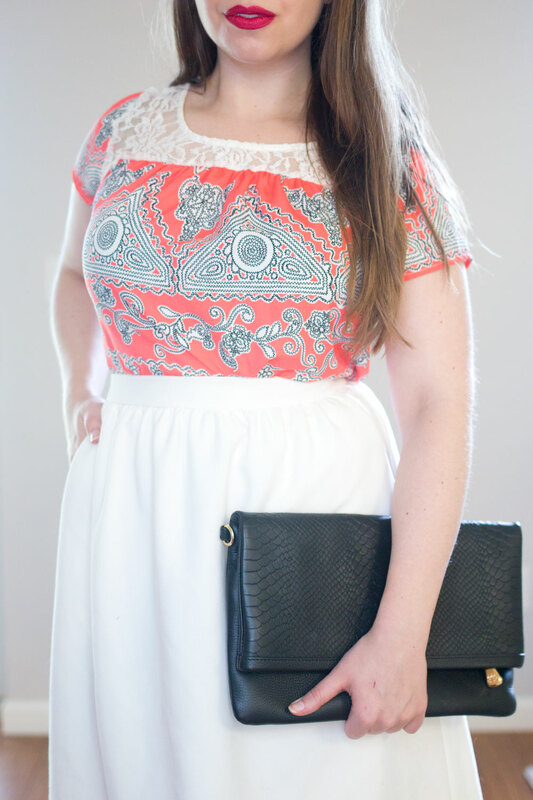 When styling this fun top from Renee C, I wanted to allow the coral accents to really pop. I kept the accessories and skirt neutral for that reason and selected one of my favorite skirts from Chelsea28 (shop similar) and open toe wedges (shop similar). I kept accessories to a minimum since this blouse has a strong print and lace accents, so I selected this Gigi New York Carly Convertible Clutch for my third piece. What’s the best about this bag is that it comes with a crossbody strap so if you’re not a clutch wearer, or only use them for special occasions, you can quickly turn it into the perfect everyday bag! And finally, I received this super cute dress from Skies are Blue. 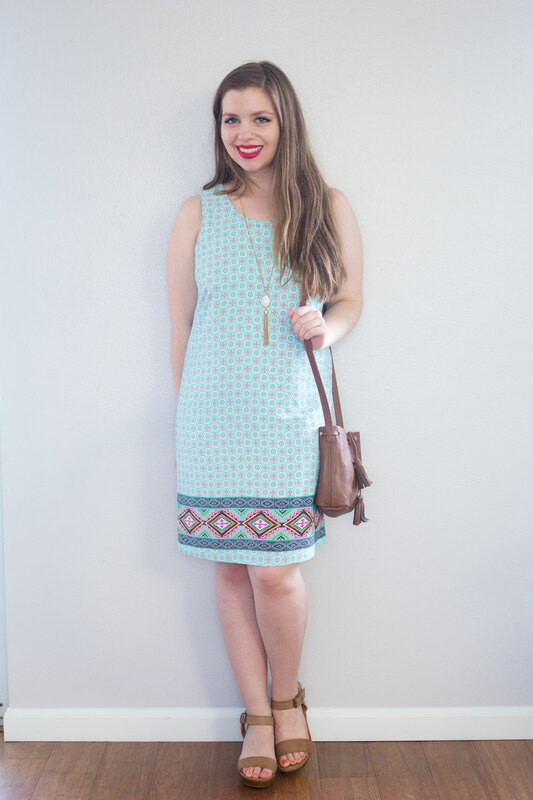 Skies are Blue is one of my favorite brands to receive from Stitch Fix, and I enjoyed this dress too! Unfortunately, it wasn’t my favorite regarding fit – I found it a little tight across the chest, and the material is not too forgiving. It puckers a bit when viewing from the side which is a problem I have with many sleeveless dress styles, sadly. Even though this particular style didn’t work for me, I would purchase something similar as the colors are so summery! 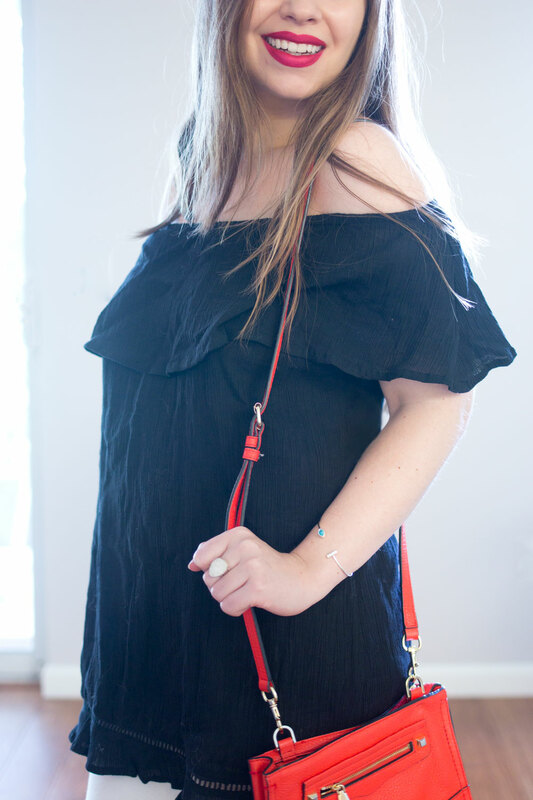 I paired this dress with a tassel necklace from Forever 21 (shop similar in pink or green, or shop the high-end version that this necklace is based on) and my trusty small bucket bag from Shaffer LA. I loved the neutral accessories, so I kept it consistent and went for these brown block heel sandals (shop similar). Love Stitch Fix? Always wanted to try it but just haven’t yet? Well, then I have great news for you! A group of Stitch Fix-loving bloggers and I have teamed up to bring you a bonus $100 gift card to Stitch Fix. Yep, you read that right, a hundred dollars! Get yourself entered below and check out the rest of these bloggers for more fun Stitch Fix reveals. Giveaway ends on June 20th, 2016 at 11:59 pm EST. Good luck! Overall, this month was another great Stitch Fix. I never keep every single item (because honestly, I like shopping a bit too much to let someone else do it for me entirely). I loved all of the fun summer colors, prints, and patterns my stylist included, as well as the trendy cold shoulder top and off the shoulder tunic! As usual, I can’t wait to see what comes in my July Fix! 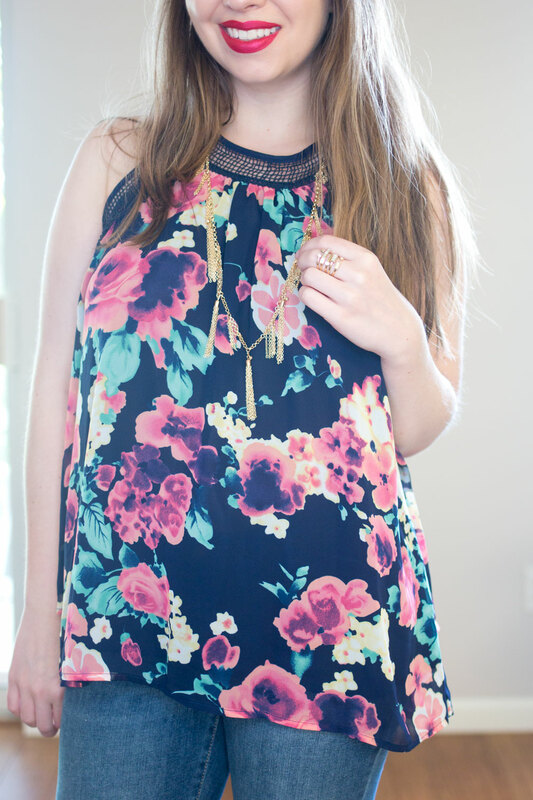 So now that you’ve seen my entire Stitch Fix and entered the giveaway, I need your help! Which piece or pieces do you think I should keep? Usually, I have one clear winner but this month I’m so indecisive! I’d love to hear your thoughts in the comments below! I love the dress! Too bad it doesn’t fit. My last order (which was my first) I kept everything even though I wasn’t sure about a few things because they were basically free with the discount I ended up liking them more than I thought. I can’t wait for my next order! I love all the blouses you got this month, but the Loveappella one is probably my favorite! I’m all about comfy tops to pair with shorts or skinny jeans this time of year. Thanks for the awesome giveaway! I actually really like that top as a tank! haha! Thanks Chelsea! I liked it better as a tank too, haha! Aw thanks Michelle! I liked how that outfit turned out. I just don’t love the print though, so I’m not sure. The off the shoulder tunic is tempting though! I love the shoulder cutout top that you styled before pulling the sleeves out! I think it looks so much better as a sleeveless blouse, tbh. This box is a tough one… so many beautiful prints and silhouettes. Can’t wait to see what you decide to pick! Me too! I think it makes me look a lot wider with the sleeves. I’m still undecided, eek! You looked amazing it all of these, Jenn! I LOVE what you got this month! My favorite is the floral top! So gorgeous! Also, what’s your lipstick color? So pretty on you! The renee blouse looks great on you! I can see why you weren’t so sure about it out of the box but I love the way you styled it! Great Fix, thanks for sharing it! Thanks so much Sarah! I loved how it looked with the skirt too! The black top is definitely a keeper! I know it’s hard wearing black with golden/red dogs, but it’s just TOO cute and I love it with the white pants! I’m a fan of the black top, personally. That off the shoulder thing is really cute on you! Not really feeling the coral colored one–that pattern is a little funny. Not a fan of the placement of the triangle-circle thingys. If the floral one was sleeveless, that one would be the winner. Thanks Kristan! The off the shoulder top is the one I ended up keeping. The placement on the tee is what bothered me too. Right over the chest is not my favorite look for large prints! I can’t wait to give non-maternity stitch fix a good try!! Bummer that the last dress didn’t work out – that’s my favorite one on you!